backup” gate operators, simply open or close the gate one last time and die. SwingSmart DC is an uninterruptible power supply system, fully functional for hundreds of cycles after power loss. easy adjustment linkage arm, forgiving swivel connection between arm and gate bracket, full 32 character LCD and tact buttons on Smart DC Controller for operator programming, and self-synchronizing technology. pending). The result is that expensive components such as the gearbox and chassis are far less likely to sustain gate hit damage. HySecurity’s newest controller board, Smart DC Controller, has all features of HySecurity’s Smart Touch Controller with the addition of a 32 character LCD screen for easy troubleshooting and programming. The intelligent Smart DC Controller off ers 2 programmable relays, RS232, RS485/USB connection, leaf delay, lightning strike and power surge protection, and real time or backlog reporting of gate malfunction or security breach conditions. Some gate installations have no access to power and other companies have green initiatives mandating highly effi cient utility use. HySecurity supports these needs by off ering the solar ready SwingSmart DCS 20. Simply incorporate the appropriately sized solar panels for number of gate cycles per day, gate size/weight and sun availability, to charge SwingSmart DCS’s two 50 Amp Hour batteries for continuous, solar powered, reliable operation. 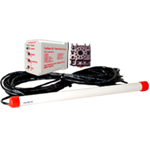 SwingSmart DC power voltage is fi eld selectable. 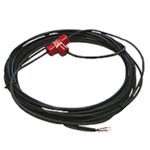 A voltage selector switch on the board easily converts operator from 115 volt to 230 volt power. 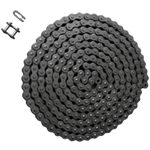 All SwingSmart DC operators are backed by a 5-year or 500,000 cycle manufacturer’s warranty. For single-family residential installations, the warranty is extended to a 7-year manufacturer’s warranty. • SwingSmart DC comes standard UPS battery backup, providing up to 300 cycles of operation after AC power loss. • Solar ready model available, SwingSmart DCS 20. • Pinch protection arm design reduces the possibility of accidental injury that can be a hazard with other scissor-arm swing gate operators. 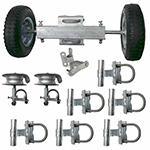 • Chassis constructed with heavy duty, high strength, and corrosion resistant, zinc plated, ¼-inch steel. Large opening in base for easy conduit access. • Attractive, fade resistant, easy to remove clam shell cover provides full access to control board without having to remove the arm. 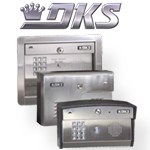 Tight fi tting, key locking cover protects critical parts from vandalism. • Continuous duty rated for high cycle operation. 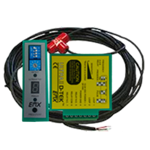 • Field programmable speed based on gate specifi cations and site requirements. • Superior and easy integration with HySecurity hydraulic operators for tough anti-tailgating and complex gate synchronization requirements. • Upload new versions of software to Smart DC Controller for all of the latest features. • Integrated security reporting to command and control software. • Listed to UL 325 Usage Classes I, II, III, and IV. • 5/7 year (commercial/single-family residential) or 500,000 cycle manufacturer’s warranty. SwingRiser raises the gate panel a full 12 inches during its gate opening cycle. The lift and swing movement allows the gate to clear obstacles such as snow, rocks, and curbs, while also solving the problem of road gradient diff erences. where the gate is an elegant bronze, ornamental iron, or aluminum work of art. at speeds from 14 seconds to 30 seconds. SwingRiser lifts and swings gates panels up to 3,000 lbs. and up to 16 feet wide. They move bi-parting gates together, or can be ordered as two single leaf operators for leaf-delay. As with most HySecurity operators, SwingRiser can be ordered in a DC, uninterruptible power supply back-up confi guration. corrosion resistance. If a specifi c post color is required, outer posts are ready for fi eld painting. Smart Touch makes arduous and costly automated gate system troubleshooting a breeze. 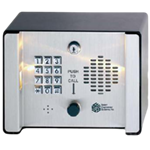 Other gate operators require time consuming, step by step access control, loop, gate edge, operator and photo eye troubleshooting to diagnose gate “failure to operate” conditions. Smart Touch off ers three exceedingly simple and formidable troubleshooting tools: a real time or downloadable fault, alert and error log that reports tailgating, gate forced open, loop failure (with HY-5A vehicle detectors) and many other gate operation abnormalities. 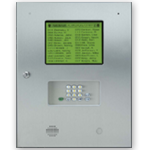 The Smart Touch LCD screen reports faults, alerts and errors, and Smart Touch LEDs light up to show circuit status. 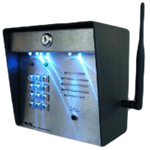 Hours of costly and complicated access control and gate system troubleshooting are saved using HySecurity’s Smart Touch troubleshooting tools. operate with leaf delay. One SwingRiser post is programmed to move before or after the other. The leaf delay confi guration is necessary when one gate leaf will close in an overlapping position to the fi rst closed leaf. 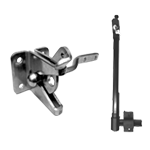 This may also be necessary for specifi c add-on locking devices (although SwingRiser comes standard with its own gate locking pin and receptacle). corrosion resistance. 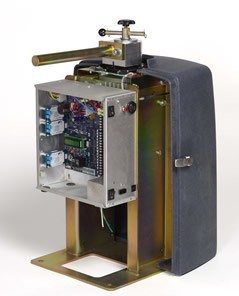 All hydraulics and controls are securely enclosed within the post or separate HydraSupply enclosure. 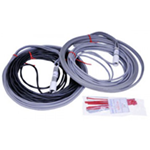 Hydraulic hoses are normally enclosed in underground conduits. Custom SwingRiser post(s) can be ordered to fi t your gate size. 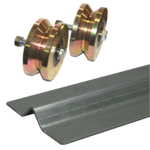 SwingRiser posts must be mounted to a structural column or wall that will support the entire weight of the swing gate panel throughout its arc. Excessive speed, insuffi cient column support, or insuffi cient footing may cause premature post wear or other operator malfunction. Form that must accompnay every SwingRiser order. These order forms guide customers step by step through the critical details of the ordering process. Note: Most SwingRisers are ordered to swing in the direction of vehicular traffi c fl ow. A two leaf entrance/exit SwingRiser confi guration usually swings in on the entrance gate and swings out on the exit gate. 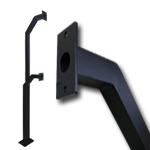 All SwingRiser orders require a signed order form that is submitted to the factory prior to production commencement. SwingRiser can be manually operated by disengaging its index arm or using the hand pump included in the motor and controls NEMA-3R enclosure. 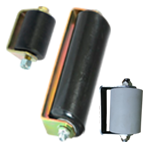 SwingRiser models run on nearly any available worldwide voltage. Available in DC models (UPS) with uninterruptible power supply, battery back-up that continue to operate for 100 cycles after an AC power outage. SwingRiser comes with a limited 5-year manufacturer’s warranty. 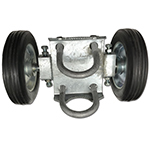 • SwingRiser opens gates up to 16’ wide and 3,000 lbs. (per leaf ). Full open cycle takes 14 – 30 seconds, depending on model. 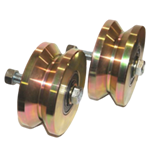 • Industrial grade mechanical and electronic components including high tensile steel, over-capacity shafts and bearings, limit cams, and hydraulic cylinders. 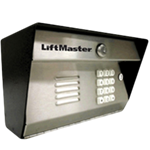 • Cylinders and limit switches are housed in the heavy duty, fully sealed post. • Separate HydraSupply, NEMA-1R enclosure holds the Smart Touch Controller, electric motor, pump pack, and standard hand pump. 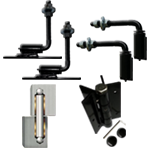 • Index arm can be disengaged or hand pump in HydraSupply enclosure can be used for easy manual operation. 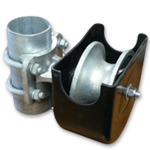 • Posts are zinc frame sprayed for rust and corrosion resistance; the outer posts may be fi eld painted. SwingRiser also comes with support post brackets. • Continuous duty rated (200,000 cycle certifi cation). 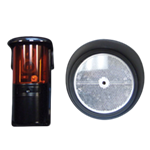 • Eff ortless integration with HySecurity StrongArm or SlideDriver for tough anti-tailgating operation. multiple-brand troubleshooting. Facilities personnel need to know only one simple operating system. issues. On board LCD reports real-time loop, system, operator,and user errors. Board LEDs show circuit status. 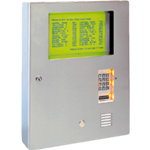 • Programmable Smart Touch Controller communicates gate status and warnings to command and control station for immediate measured security response. 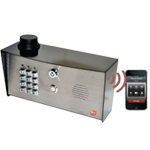 • Security integrators or end-users choose from numerous programmable options including master slave, antitailgating, leaf delay, and timer to close functions. 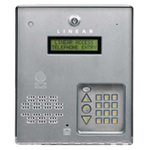 • Three user relays off er 26 programmable options, making it easy to connect SwingRiser to any external access control, obstruction protection, or security device, and create complex vehicle entry validation, surveillance, and sequencing without the addition of costly, custom PLCs. Relays have optional normally-open or normally-closed connections. • Uploading new software to fl ash memory updates operator with latest features. 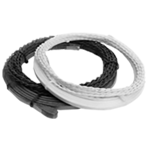 • Available in nearly all domestic and international singlephase and three-phase voltages. 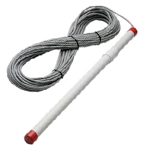 • Industrial-grade hydraulics certifi ed to -40F to 167F (-40C to 75C ) temperatures from bitter permafrost to broiling desert conditions. • Listed to UL usage class I, II, III, and IV.